Every year lists of New Year's resolutions are made, goals for the coming year are outlined, intentions for new healthy habits are adopted and self-improvement books are purchased. As we enter into a new year, we are lured into a space of reflection and change, whether self-imposed or inspired by the collective. No matter what the desires are, the point is many of us are continually striving to advance, improve or grow in some regard, either personally, professionally or both. In fact, one study found Americans spend approximately $10.5 billion annually on self-improvement, and this trend is expected to rise. Growth is a good thing, particularly when it's tied to learning. As Albert Einstein once said, "Once you stop learning, you start dying." So aside from the healthy diet plans, self-improvement books and motivational seminars, what are ways to advance personally and professionally that will become part of your experience and not just a brief thought? Leveraging lifelong learning, which not only has inherent benefits to your career, but also your wellbeing, provides six key ways to advance. This is the most important step to any change. Just saying I want more money, more clients, more love, or more happiness is not going to usher in those wants without a deep-seated, intentional desire. Being clear about what you want and seeing what that will look like through imagination and description will set an image for you and keep you on point. The journey or experience is the excitement not the destination. Knowing what you want and having clarity about it will allow you move into practical steps of how you are going to do that. Aristotle said, "We are what we repeatedly do. Excellence then is not an act but a habit." That is what mastery is all about. Achieving excellence in what you do elevates you to another level and brings more fulfillment to the work. That is why studies show improving upon an existing skill boosts career satisfaction, opportunities for role advancement and leverage to bring in more financial abundance. Additionally, you are recognized as an expert in a specialized area because you have mastered excellence. There are several ways to deepen a skill and turn it into artistry. Some include advanced education such as webinars from professional associations, seminars at industry conferences and continued education courses, as well as practical "hands-on" workshops. Also remember mastery comes from the "want" or desire, so in your daily work of doing, feel into that inner intuitive voice. When you are present, in the zone, and tuned in, your skill changes to a natural knowing. Excellence then is not an act but a habit....Achieving excellence in what you do elevates you to another level and brings more fulfillment to the work. 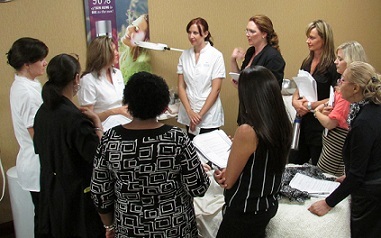 Why not set a vision to learn a new technique, modality or tool in the treatment room? Doing so will stretch you into new areas and add to your dexterity as an esthetic professional, giving you more ways to meet the unique skin needs of each of your clients. You will also be able to add variety to your menu and add-on services. You might even consider introducing an area of specialization, such as working with men or skin of color or oncology patients. Webinars, in-person seminars, trainings by equipment manufacturers, or even shadowing an expert in this area for a day provide great ways to develop new creative ideas for your business. A strong network will inspire you to move mountains. Your network may be large or small, but it will only be effective if you are with people who are also motivated and excited. Being in a network of fun, happy professionals will lift you up when doubt or frustration comes in. It is key that there is a common theme to the networking group, and not just about complaining or critiquing the world. With the social media opportunities, networking doesn’t always have to be in person either. Being able to tune into a strong network of like-minded professionals from the ease of your home does give support and encouragement. Or you could find a small, intimate event that has a learning component built into it. It’s much easier to spark conversations when everyone is there for a common reason. Depending on the time you want to commit to this, another alternative is to create a plan to regularly touch base with your existing network. You can do this with a brief email, a quick text or phone call, a handwritten note, sharing their posts on social media, or even attending community or industry events and conferences. New experiences will spark inspired ideas and open you to new innovative approaches, whether its clever ways to market your business, a new technique for the treatment room, or fun, inspired ways to engage your clients and bring more opportunities to them. You might consider traveling to a foreign destination, reading a book in a new genre, shadowing another esthetician who operates in a different area or who specializes in an unfamiliar modality, or attending an inspirational conference. Two important ways to keep your tank full is to take time to rest and create a pipeline to stay on top of emerging trends. Recharging your batteries is absolutely essential to being effective in your professional life. Give your mind and body time to rejuvenate. That might be through breathing, meditation, yoga, being in nature or simply reading a book-whatever it is that brings you bliss. To stay engaged and on the forefront of trends, subscribe to industry blogs and publications like Skin Inc., follow industry influencers, or create a Google Alert to send you news pertaining to a specific topic. Find a system that works for you so it becomes habitual and leads to excellence. Embracing lifelong learning affords you the ability to stay ahead of the competition and keeps you inspired. Socrates said, "Education is the kindling of a flame, not the filling of a vessel." To keep the flame kindled, you have to achieve a balance of meaningful learning, time to rest and rejuvenate, and creating opportunities for new, fulfilling experiences. Often there are ways to combine all of these elements. Experiences like the RA Symposium provide opportunities for learning new skills, strengthening your network and recharging your battery.